Celebrities tend to look flawless from head to toe and need to keep their look fresh since their image is their job. So when Nicole Kidman, Uma Thurman, and Eva Longoria had a makeup malfunction, everyone was stopped dead in their tracks and left wondering, what the ...? These three actresses all where photographed with had tons of white powder under their eyes. 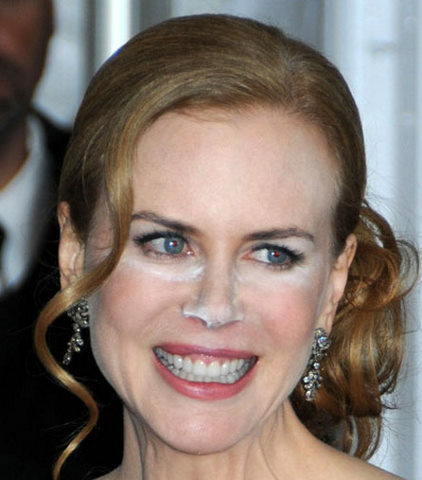 You began to wonder how can these celebrities walk outside knowing that the powder is clearly visible. Well, it wasn't visible to the naked eye but it was visible to flash cameras. "The white powder that Uma and Nicole Kidman had trouble with is by Make Up For Ever and is their HD Powder. It’s white but goes on transparent. It’s great stuff, really hides everything and makes your skin look flawless, only problem is it shows up white if you’re photographed.," said one commenter from the Huffington Post. The powder is Make Up Forever Microfinish Powder that is only meant for HD TV or HD cameras. It is used to set the makeup and it works great, but it should not be used with flash photography.